These beautiful Victorian fans are perfect for all your vintage card making, scrapbooking and paper craft projects. 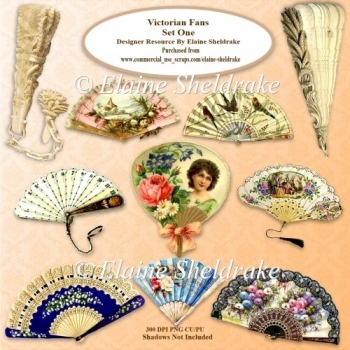 This set includes ten beautiful Victorian fans PNG digital images and a backing paper which I have digitally cleaned, the fans are all on transparent backgrounds and the backing paper is in JPG format. Perfect for scrapbook pages, card making and all manner of paper crafts.